Jarðabókin aims to make available the most detailed historical documents describing the way land was used in late medieval to early modern Iceland, roughly 1500-1860. View this great resource created by Gísli Pálsson. Swandro, Orkney and the Swandro – Orkney Coastal Archaeology Trust2018 has been an exciting year at Swandro. Find out about the finds and also the site being featured on Digging for Britain BBC programme. Due to coastal erosion, there is a real need for urgent further excavations in 2019. The SAA Island and Coastal Archaeology interest group is aimed at archaeologists and other scientists with interests in the techniques, methodologies, and theories used to investigate island and coastal regions. This is particularly relevant to those of us working in the North Atlantic. Inscribing Environmental Memory in the Icelandic Sagas project aims to examine environmental memory in the medieval Icelandic sagas, with a prominent focus on historical processes of environmental change and adaptation. Emily Lethbridge has developed an interactive map of place names mentioned in the Icelandic Sagas. Also read her Saga-Steads blog of her journey around Iceland. She also appears on BBC Radio 4's In Our time discussing Icelandic sagas. The Human Ecodynamics Research Center (HERC) at the CUNY Graduate Center is coordinating the effort of scholars in a formal research collaborative addressing crucial issues of sustainability, resilience, and the future of humans on earth. Orkney College UHI are co-ordinating a programme of archaeological heritage-based activities for children, youth, and lifelong learners of all ages to get involved with Orkney's fantastic archaeology. The Vilnius Declaration established the European Environmental Humanities Alliance, more details on this initiative are available here. The Atlas of Community-Based Monitoring in a Changing Arctic is great initiative where Arctic communities are actively involved in observing social and environmental change. An interactive atlas displays information about these community projects. Also see the related ELOKA project. NABO is a International Council for ArchaeoZoology (ICAZ) working group and updated details about this important research collaboration are available. Details of NABO's NSF funded involvement in International Polar Year can be found here. We have an active group of modellers and information is available here. 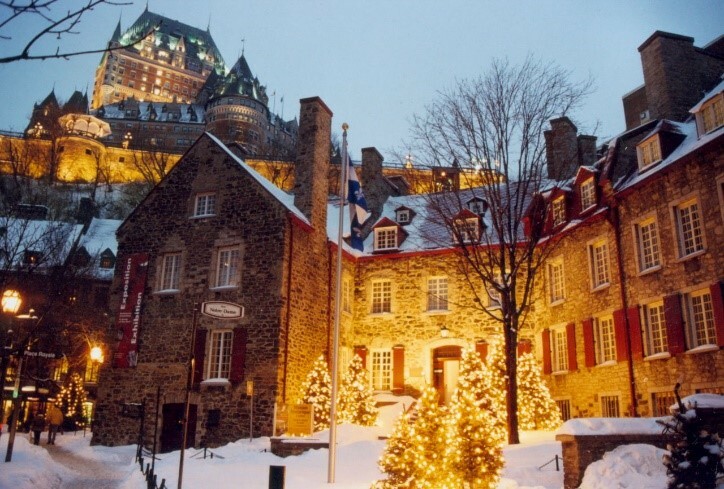 The NABO 2019 General Meeting will be hosted by Dr. Jim Woollett of the Université Laval in lovely Quebec City in May 19-20th 2019. The NABO meeting is being held in collaboration with the 2019 Canadian Archaeological Association meetings May 15-18 in Quebec. More details to follow. An interdisciplinary course (16-26 August 2019) is offered in the Environmental Humanities and Social Sciences, located at Bárðardalur, northern Iceland, connecting local communities and issues with global developments, studying the Lake Mývatn area and the Bárðardalur valley on the banks of the glacial Skjálfandafljót river with its magnificent waterfalls. More details are available here. The 2018 excavations at Swandro are featured in the BBC Digging for Britain archaeology programme. The Oceans Past Initiative (OPI) is a global research network for marine historical research. They produce newsletters every month and these can be read here. Smiarowski et al. (2017)The Oxford Handbook of Zooarchaeology. This summary paper provides an overview of ongoing comparative research as well as references for data sets and more detailed discussion of archaeofauna from these two island communities. Swandro – Orkney Coastal Archaeology Trust is racing against time and tide to raise the money necessary to excavate and record the site at the Knowe of Swandro, in the Orkney island of Rousay. Reynolds and colleagues have pubished a paper which builds an a millennial-length, annually resolved and absolutely dated marine climate record from shells of the long-lived marine bivalve Arctica islandica (d18O-shell). This will be invalable to those of us trying to understand the influence of climate variability on North Atlantic communities. A new paper led by Magdalena Schmid demonstrates the use of tephrochronology in dating the earliest archaeological evidence for the settlement of Iceland. It also suggests the redating of the iconic Landnám and Eldgjá tephra layers in the light of recent work on the Greenland ice cores. Juha Marttila has just published a paper titled "Resources, Production, and Trade in the Norse Shetland" in the Journa of the North Atlantic. Using sediment cores from Freshwater Pond, Barbuda, reconstructions of past effective precipitation through gastropod remains and dO18 from ostracods has established that during the Little Ice Age effective precipitation was more variable in time and space than previously thought. The management of zooarchaeological data became a growing problem during the career of Brian Hesse and his early engagement with attempts to digitize recording systems needs recognition. This paper discusses Brian's influence on the digital management of zooarch data and his influence on the NABONE data management system is gratefully acknowledged. Our new CIE page provides details about the Comparative Island Ecodynamics in Iceland and Greenland Project, with information about many strands to this exciting multinational and interdisciplinary research project. Three papers on isotopic studies in the North Atlantic region have been published in JONA. Written by Doug Price, Karin Margarita Frei, and Elise Naumann these are part of the Viking Settlers of the North Atlantic: An Isotopic Approach special volume. Go to JONA's website for more details. Árni Einarsson has just published his fascinating research on the extensive system of late 9th and early 10th century turf walls found in NE Iceland. More details available on the JONA website. Ten research articles comprising the 2010 Hebridean Archaeology Forum special volume have just been published in the Journal of the North Atlantic. They are also available on BioOne and further details are available here. A new paper (Bartrons, Einarson, Nobre, Herren, Webert, Brucet, Ólafsdóttir and Ives, 2015) has just been published in Ecosphere on the zooplankton community composition in Lake Mývatn, Iceland. Understanding the ecosystem of Mývatn is directly linked to our understanding of human ecodynamics since the time of settlement in the region. The NABO Project Management System has been updated to all owners of projects to assign other people to be editors, change an individual project into a parent project, associate any individual project with any parent projects and change xy locations to areas and vice versa. Go to the NABO PMS and login or register. Tephrochronology not only provides chronological controls for archaeological sites in Iceland, but it also allows us to study the rates of environmental change through calculating sediment accumulation rates. Two new tools have been launched on Tephrabase, which allow the automatic creation of tephrostratigraphic profiles and calculation of sediment accumulation rates from 200 profiles in Skaftartunga. Access the tools here. This recent paper (Gunnarsson et al. 2015) on the impact of volcanic dust on variations in bird abundance in Iceland has implications for many NABO researchers. Read the paper here. This multi-author paper investigates the influence of walrus hunting and the export of walrus-tusk ivory and walrus-hide to Europe as a driver for the early settlement of Iceland and Greenland. Read the paper here. Find details of recent articles published in the Journal of the North Atlantic, including special issues. This report on surveys and sampling in the southern Eastern Settlement, Greenland, Summer 2013 is part of the Comparative Island Ecodynamics in the North Atlantic (CIE) project an NABO website. Christian Koch Madsen's PhD thesis is now available from the NABO website. A preliminary report on excavations at the the midden at Skútustaðir, Mývatn is now available. The purpose of the 2013 excavation was to recover additional animal bone, artifacts and botanical samples - from the Middle Ages, roughly AD 1000-1500. Ramona Harrison and Ruth A. Maher have compiled a series of separate research projects conducted across the North Atlantic region that each contribute greatly to anthropological archaeology. More details are available on the Lexington Books website. Véronique Forbes has written prelimnary results and analysis report on the insects remain found at the Gásir Hinterlands site at Möðruvellir. This is a preliminary report on the 2013 field season at Skuggi. The 2013 Skuggi midden and structural excavations are a continuation of work started there in 2008 and 2009.. The latest NORSEC Laboratory Report contains the results of the analysis of the archaeofauna from the Viking Age farm mound of Siglunes, near Siglufjörður in the far north of Eyjafjörður. Geomorphological change and the "lost harbours" of the Middle Ages. The SAGES-HaNOA workshop aims to capitalise on the opportunities being created by HaNOA to develop new collaborations within SAGES and promote integration between HaNOA, the Scottish Archaeology and the Problem of Erosion Trust (SCAPE) and Scotland's Coastal Heritage at Risk Project (SCHARP). Wednesday 12th February 2014 9am-1pm - Edinburgh. Further detail available here. A two week (August 1st - August 15th 2014) summer course (10 ECTS*) in Iceland for Masters and Doctoral students with interest in supplementing their studies that fall within the following disciplines: Literary Ecocriticism, Environmental History, Environmental Archeology and Environmental Anthropology. Further details on this course..
Adolf Friðriksson's PhD thesis is now accessible. It is written in French, but an English abstract is available. NABO was founded over 25 years ago to attempt to cross-cut national and disciplinary boundaries and to help North Atlantic scholars make the most of the immense research potential of our damp and lovely research area. NABO has worked to aid in improving basic data comparability, in assisting practical fieldwork and interdisciplinary ventures, in promoting student training, and in better communicating our findings to other scholars, funding agencies, and the general public. The HERC center was established at the CUNY Graduate Center in 2011 and is now undergoing a revisioning process that we hope will add value and create more opportunities for CUNY scholars to engage with initiatives and networks active in archaeology of global change research. We hope to periodically produce newsletters like this one (please feel free to send materials and suggestions) which will soon be posted on a revised HERC website. The NABO 2019 General Meeting will be hosted by Dr. Jim Woollett of the Université Laval in lovely Quebec City in May 19-20th 2019. The NABO meeting is being held in collaboration with the 2019 Canadian Archaeological Association meetings May 15-18 in Quebec, and we hope that NABO participants will also attend and participate in the CAA meeting. We hope to present several sessions at the CAA around NABO-friendly themes including Maritime Adaptations & the Oceans Past Initiative, North Atlantic Encounters (culture contacts, world systems, and impacts of modernity) and "Burning Libraries" responses to climate impacts on heritage and science. Other themes and session ideas are most welcome and the NABO workshop following CAA is open to all and we hope to use it as both a follow on to the papers presented at CAA and an opportunity for forward planning and collaboration with the PESAS (Paleoecology of Sub Arctic and Arctic Seas), Oceans Past Initiative, Humanities for Environment Circumpolar Observatory, and the new NABO Greenlandic RESPONSE project. All are welcome, some travel assistance may be available. For more information on the NABO 2019 meeting contact Tom McGovern (thomas.h.mcgovern@gmail.com), to propose a session or offer a paper at the CAA please contact Jim Woollett (James.Woollett@hst.ulaval.ca). The multi-period site at the Knowe of Swandro on the west coast of the island of Rousay, Orkney is being destroyed by the sea. Excavation has revealed that the site is a multi-period settlement mound dating from the Iron Age through to the Pictish period and probably to the Viking period and the Westness Viking houses, which we have now shown overlie part of the site. Participation: places available for 2019 The excavation (directed by Dr Julie Bond and Dr Steve Dockrill) incorporates a Field School training programme and provides an opportunity to gain excavation experience on a complex archaeological sequence in the heart of one of the world’s most significant archaeological landscapes. For details of the project please visit www.swandro.co.uk. Download PDF with further details. 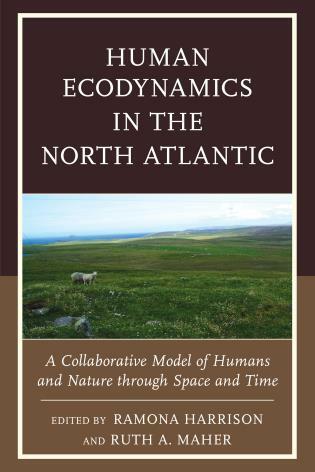 Co-organized by: The Svartárkot Culture-Nature Project; The Reykjavik Academy; the City University of New York; and the Stefansson Arctic Institute, in cooperation with NABO (The North Atlantic Biocultural Organisation); NIES (The Nordic Network for Interdisciplinary Environmental Studies); GHEA (The Global Human Ecodynamics Alliance); and the Circumpolar Networks case of IHOPE (The Integrated History and Future of People on Earth), a core project of Future Earth. Official course description, including application procedures, deadlines, tuition, practical arrangements, and full contact details. The Greenland National Museum and Archives in partnership with the Institute for Field Research is hosting an international archaeological field school for undergraduate students in South Greenland, summer of 2019. Scholarships are available through the program and IFR to help reduce the cost for students. This field school is a four-week adventure in a rugged environment that will provide students with a crash course in Arctic Archaeology. Participants will learn how to identify sites and features through landscape survey, perform “keyhole” excavations, and learn how to document their observations quickly and efficiently. Students will not only learn about archaeological field methods but will also have the chance to interact with the local community and gain insight into emerging issues regarding the impact of global climate change on cultural resources in the Arctic. Due to the ongoing issues surrounding the loss of organic deposits in South Greenland, emphasis will be placed on rapid and efficient intervention techniques in the field. This program is RPA certified (Register of Professional Archaeologists) and will benefit students who plan to pursue cultural resource management work in the future. Archaeological investigations in 2019 will be conducted in the small hamlet of Igaliku in South Greenland. During the Norse period, Igaliku was the site of the episcopal manor farm of Garðar, established in AD 1124. Garðar was a geographical nexus between the most populous parts of the Eastern Settlement and possessed a large cathedral dedicated to St. Nicolaus. As the largest church in Norse Greenland, this cathedral reflected the manor’s great wealth and political importance. Although there are theories explaining why the Norse eventually abandoned Greenland in the mid-1400’s, many questions still remain unanswered. In the 1700s, colonial era Inuit farmers resettled Garðar and created a way of life very similar to the Norse – one that continues to this day. This area was nominated as UNESCO World Heritage property in July 2017 and bears witness to a rich and vibrant history of farming and pastoralism in South Greenland. Rapid climate change poses a particular challenge our cultural resources and the US National Park Service has launched a Cultural Resources Climate Change Strategy: "Cultural resources are our record of the human experience. Collectively, these archeological sites, cultural landscapes, ethnographic resources, museum collections, and historic buildings and structures connect one generation to the next. The National Park Service is charged with conserving cultural resources so that they may be enjoyed by future generations. Climate change is adding challenges to this role, and will continue to affect cultural resources in diverse ways. At the same time, through the tangible and intangible qualities they hold, cultural resources are also part of the solution to climate change." This NSF-funded project (US$1.3 million between 2012-16) supports a series of interlocking excavation and survey projects in Iceland and Greenland aimed at better understanding the complex interactions of human choice, environmental change, climate impacts, and early world system effects on the very different historical pathways of the Nordic settlements in Iceland and Greenland. This is an umbrella program building on the successful NABO International Polar Year collaborations (2007-11), which shares logistics, staff and students, and funded specialists in Zooarchaeology, Archaeobotany, Geoarchaeology, Radiocarbon and Stable Isotope analysis, Models and Data Management, and community outreach. More details are available from our new CIE page. IHOPE have put together a theme to establish the threats to our heritage from global environmental change. These threats include wind, the sea and rising soil temperatures. This is destroying invaluable archaoelogical records and often previously unknown sites. The American Anthropological Association's Global Climate Change Task Force produced a report Statement on Humanity and Climate Change, which highlighted eight main points. More details on this new IHOPE Theme are available here. Other recent links to the impact of climate change on archaeological records include the NOAA Sea Level Rise Viewer, Climate Change and California Archaeology Studies and the Climate change impact on the Point Reyes National Seashore, Marin County, California report. A new article on www.futureearth.org website discuss the NABO communities research into over 1000 years of sustainable natural resource management of waterfowl around lake Mývatn, Iceland. Written by Árni Einarsson, Megan Hicks, Kesara AnamthawatÃ¢â‚¬â€œJónsson and Tom McGovern. Archaeological excavations of a midden at Skútustaðir has revealed large numbers of egg shell fragments in contact with the well dated Landnám (871±2 CE) tephra layer. This demonstrates that sustainable egg collection and water fowl began as soon as the first settlers colonised this area. Read the full article for more details and more reports on this excavation can be found here. In 2014, the Union of Concerned Scientists (UCS) published Landmarks At Risk report and a strategic workshop was organized on preserving cultural heritage in a changing climate. A Call to Action on climate and cultural resources which resulted from the meeting was co-sponsored with the National Trust for Historic Preservation, the Society for American Archaeology and the J.M. Kaplan Fund. NABO was one of the first signing organisations. For further details contact Adam Markham, Deputy Director of Climate and Energy at the UCS. This video was shot by Regan Alsup and shows the impact of coastal erosion on the archaeology of Brora, Scotland. The SCAPE Trust (Scottish Coastal Archaeology and the Problem of Erosion) aims to conserve and promote the archaeology of Scotland's coast. The related SCHARP (Scotland's Coastal Heritage at Risk Project) aims to provide opportunties for the public to take part in archaeological and historical exploration and discovery. Ramona Harrison and Ruth A. Maher have compiled a series of separate research projects conducted across the North Atlantic region that each contribute greatly to anthropological archaeology. This book assembles a regional model through which the reader is presented with a vivid and detailed image of the climatic events and cultures which have occupied these seas and lands for roughly a 5000-year period. It provides a model of adaptability, resilience, and sustainability that can be applied globally. Further details on this book are available on the Lexington Books website. Journal of the North Atlantic Special Volume No. 3 presents one of the most comprehensive studies to date of the food consumption and dietary economy of a historical population based on stable isotope analysis. The Norse Greenlanders are in this respect particularly of interest because their settlements in Greenland were constrained chronologically (ca. 500 years) and physically (the pasture lands of Southwestern Greenland). Archaeological efforts in Greenland have very likely uncovered all the settlement areas, including churches and cemeteries; thus, we can be reasonably assured that while new finds of, e.g., farmsteads may appear in future, the overall picture of the Norse settlements is pretty much fixed. A lot of new data has been added to our Project Management System, including several new Scottish sites, more Icelandic project and the addition of sites further south in Antigua and Barbuda and Cuba. We have created a Project Management System, where NABO projects can be entered by researchers, displayed on a map and content made available to others. Please check out this new feature here or use the projects link above. If you wish to enter data into the system, you must first register but no registration is needed to search for projects and download data. Gavin Lucas and Fornleifastofnun Íslands have received the DV Cultural Award for The Hofstaðir. Excavations of a Viking Age Feasting Hall in North-Eastern Iceland monograph. The jury's comments follow: "In 1992 started a large scale archaeological excavation at Hofstaðir near Mývatn, NE-Iceland. The work continued for over a decade. The results have now been presented in a very detailed and elegantly presented monograph. This works offers many new insights into the Viking period in Iceland, the nature of the Settlement and the interplay between man and nature in 9th-11th century Iceland". Surviving Sudden Environmental Change: Answers from Archaeology. 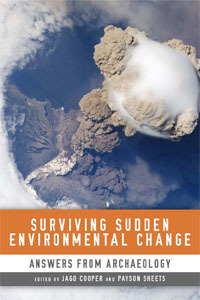 Cooper, J and Sheets, P. (eds) (2012) Surviving Sudden Environmental Change: Answers from Archaeology . University Press of Colorado, Boulder p256. 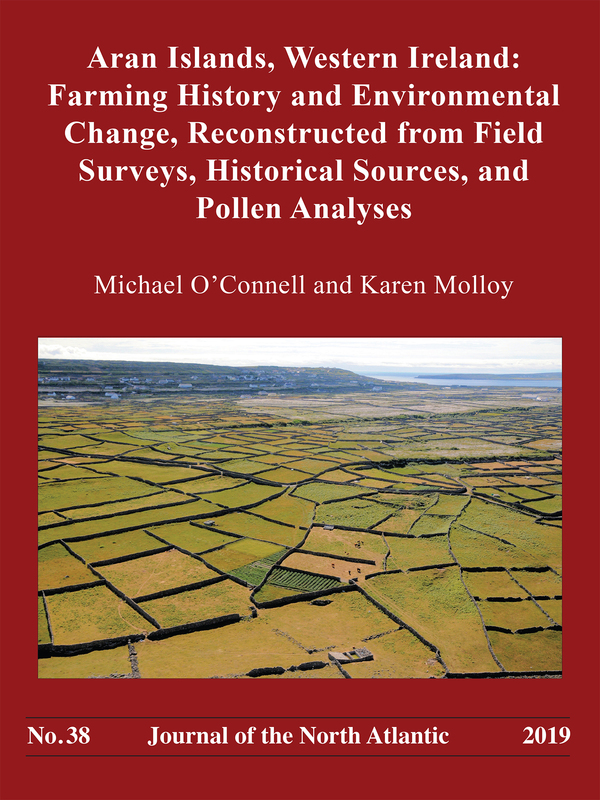 The University Press of Colorado have just published a new book on how the archaeological record can help us to understand how we can cope with sudden environmental change. This book arose out of the October 2009 meeting in Maine, which lead to the creation of GHEA and this is the first major publication from our group. This will hopefully be the first of many collaborative publications from the GHEA community. Feel free to join GHEA here. The Kids' Archaeology School (Fornleifaskóli barnanna) was formally established in the spring of 2007 and has since grown in scope and aim. The Kids archaeology program is now a key part of the Historical Ecology: Islands of Change Initiative, funded in part by the National Science Foundation Office of Polar Programs in the USA. This collaboration allows Icelandic students to interact through organized activities with students in in New York, Greenland, Orkney, Faroes, Norway, Antigua/Barbuda, Curacao and Bonaire. Details about the Kids' Archaeology School, Iceland can be found on the NABO website and the Fornleifaskóli barnanna site. The latest report on The Kids Archaeology Program (Fornleifaskóli barnanna) by Sif Jóhannesdóttir and Unnsteinn Ingason is now available. 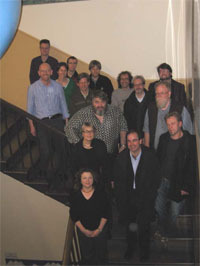 At the 2009 Viking Congress held in Reykjavik and Reykholt The Institute of Archaeology (Fornleifastofnun Áslands) (FSÁ) made a major donation to the NABO website data project of over 20 years of research amounting to over 300 survey and excavation reports in downloadable pdf format. 70 sites/projects and 149 reports loaded into our system, they can be accessed here . We would like to gratefully acknowledge this generous gift of hard won data by FSÁ to the Icelandic nation and to the international community and we look forward to working with them in the future to provide updates to this impressive body of information. 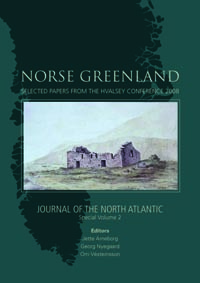 The Journal of the North Atlantic has recently published the book Norse Greenland - selected papers from the Hvalsey Conference 2008. Editors are Jette Arneborg, Georg Nyegaard and Orri Vésteinsson. 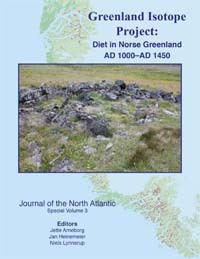 The book is about 200 pages and includes 16 papers on various aspects of the Norse settlement in Greenland. For those interested in purchasing a copy of the book, contact kristborg@instarch.is. October 2010 saw the launch of our sister GHEA website. The Global Human Ecodynamics Alliance (GHEA) is an organization of social scientists, natural scientists, historians, educators, students, policy makers, and others interested in promoting cutting-edge research, education, and application of the socioecological dynamics of coupled human and natural systems across scales of space and time. As of May 2016 there are now 203 members and to join this dynamic group visit http://www.gheahome.org. NABO members were very active during IPY on the national and international scale, and major funding was secured from Danish, Canadian, and US sources for an ambitious effort to continue and expand NABO collaboration with a special NABO IPY Project: Long Term Human Ecodynamics in the Norse North Atlantic: cases of sustainability, survival, and collapse. This project was funded at just over US$ 900,000 and had fieldwork seasons 2008-10 in the Shetlands, Faroes, Iceland, and SW Greenland. More details of our involvement in International Polar Year can be found here. NABO is not all about the northern North Atlantic. We are also active in the Caribbean. Our work in Barbuda began in 2000 with CUNY archaeologists and an international team of environmental researchers, in collaboration with the Antigua & Barbuda scholars and agencies and by the invitation of Dr. Reg Murphy (head of archaeology for National Parks Antigua and Barbuda). Reports on our work in Barbuda are available here. The NABONE system consists of this coding manual, a developed Microsoft Access database with useful queries and reports, and an Excel spreadsheet set providing analytic output similar to the old Hunter College QBONE system. Our multinational and multidisciplinary nature means that we publicise our activities as widely as possible. Please let us know if you have any queries about anything on this website and especially if you feel you can contribute.